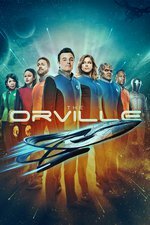 The Orville encounters a dangerous spatial anomaly, and Kelly recommends the unambitious John be put in charge of the investigation after she discovers his genius-level aptitude test scores. But she also causes a crisis of confidence in Ed when he discovers that she was the one who recommended him for command of the ship. I really liked this one. I liked John getting the tryout to be engineer. I liked the mention of Flatland, and the graphics of the two dimensional civilization were amazing. I even liked Macfarlane and Kelly almost getting back together. In general, I have enjoyed this series much more than I expected to, and am glad it got renewed. Not being a POC myself, I don't feel remotely qualified to say if John learning to hide his smarts to fit in was problematic or not! Like, is it a bad trope to say his friends would think he was weird for being smart, or is that something that reflects the real experience of gifted POC? I have heard some POC say things like that, so... I dunno. When I heard the jazzy music outside the ship I was like, Oh crap, Macfarlane's gonna do one of his big jazz numbers. But no. I was also kind of fearing the big Tron 2D world was going to turn into an 80s video game parody, like they'd get chased by lightcycles or space invaders or something. On Family Guy, it SO would have. But thankfully this show continues to not be Family Guy does Trek. This continues to be such an odd duck series. I'm enjoying it, and I've been both impressed and embarrassed by it. None of the actors seem like weak links, the stories are interesting but generally undemanding. It's like there was a teleporter accident on the set of the 50th Anniversary Trek Show, and all the serious Trek went to Discovery (which I enjoy but not thoroughly) while the earnest and fun Trek went to Orville. And we get to watch both. Argh. I just saw my comment again and now I feel icky about part of it and I'd like to try and clarify. John's story did remind me of things I've heard from some gifted POC, that when they were young they felt like they couldn't flaunt their smarts or their friends might think they were weird. This was just a thing I'd heard, not a thing I was saying based on any personal experience. I was definitely not trying to convince anybody this is a common thing, because I have no idea if it is. I was pretty clueless about the subject and wondered what more informed people would make of this episode, but the way I phrased it was awkward at best. This is pretty awkward too. As a fan of TOS first, because reasons, this seems to get it right. Music and cheap sets in particular. I'm as surprised as the next person about that. This is the episode it became presidential. I am glad that they are managing to keep a reasonably light hearted tone and appear to have phased out the fart jokes. 2-D space was also very pretty. I liked how they were in 2D space, how little sense it made, and how they were kinda cool with that. I am liking the show still but thought this episode was weak. Flatland was completely wasted, it might as well have been the Pocket Dimension or the Elevator Between Floors or the Clinic Waiting Room. I mean the graphics were cool but nothing actually happened of relevance to the 2d universe except "oh no we're all gonna die" and some nifty graphics that made no sense. If you're gonna reference a sci-fi classic you should use it better. Also we're back to some awkward jokes that are mistimed and fall flat. Particularly the part about bringing a cat on the bridge. I'm OK with those moments when they work, but these felt fake. If John spends all his time in engineering and isn't on the bridge with Gordon there may be a lot less of that in the future? Poor Yaphit, he was right to be pissed about being passed over in engineering. And his new boss is a man who literally violated his body. I imagine a darker parallel universe show where Yaphit begins plotting his revenge. Naturally he wears a beard. I'm with Nelson; I was left cold by the personal stuff, even while the pocket-universe stuff was a nice thing that gets thrown away. I want a whole episode of them stuck in there, not the convenient hidey-hole as which they used it. And both the humor and the engineering drama both did feel fake, I agree. I'm going to blame the director, though. We've seen the same kind of comedy from the same people, so if it works one ep and not another, likely the director missed the boat, comedically speaking. I thought the John stuff was out-of-nowhere nonsense until we saw how he hides his brain-- you'd think that would give him something in common with Alara-- where's that bonding scene? -- but I guess a double-life is a hard thing to write plausibly on a starship. I gotta say, as much as the character grates intentionally, I want more of Dann, the annoying crewman who's just trying to get a social thing going with everyone. Dann is a bit of comedy that has been delivering consistently, IMO.